MESI Review 2019: Is MESI a Good Hosting? Founded in 2002, Mesi is an ISO 9001-2008 certified hosting company based in Argentina. They provide SSD hosting and domain registration services, in addition to online marketing and mass data storage solutions. 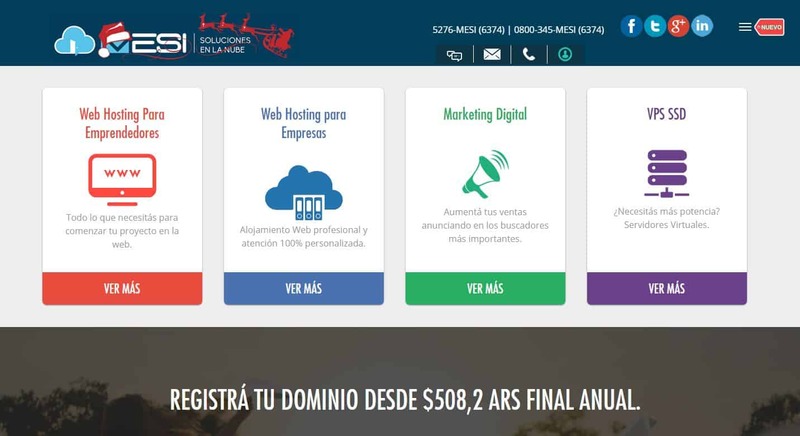 MESI provides affordable hosting for entrepreneurs and companies, virtual private servers with SSD, and digital marketing to over 5,000 clients in Argentina and the rest of the world. Regardless of whether you’re an individual entrepreneur or established enterprise, Mesi gives you everything that you need to kick-start your business online at a very fair price. Registration is pretty simple, and with their starter package, you get about 2GB storage. That may look like an insufficient amount of storage, but it’s enough to host a couple of websites. You can easily create your website within 20 minutes of signing up via one of two options. I recommend the latter if you’re just starting out as it comes with over 200 mobile-friendly templates that cover many categories such as Art, Food, Health, Business, Entertainment, and E-commerce. It’s easy to lay out pages, add content, embed videos and maps, and even add social network links. In addition, Mesi packages also come with SEO tools for online marketing. I encourage you to try their demo just to get a feel for their builder. Every account comes with superfast SSD storage, which though more expensive than HDD, provides better performance and reliability. It’s not affected by heat, shock damage, or magnetic fields, so you can rest easy knowing your websites or apps will always be accessible to your customers in extreme situations that would otherwise knock HDD out of service. Their simple and user-friendly interface gives you the convenience to manage your web space remotely as long as you have access to PC and internet. It won’t take you more than three hours to master their control panel. From the admin panel, you can manage your databases, email accounts (POP3 / IMAP), domain name settings, and configure security settings. If you require assistance in transferring your websites or databases to their servers, contact the support team. They will transfer your domain, website, and all files at no cost. But if you know your way around, you can use FTP to import databases via MySQL. Once your websites are up, you can proceed to create your email accounts, and then secure all of them with secure with their SSL. Moving away from the shared plans, I’ll touch on their VPS briefly. They have four plans to choose from. Their starter package comes with 2 CPU cores with 4GB RAM and 80GB SSD storage. You can install any of the 50+ apps including databases and enterprise software. Scaling up, you will get more storage space and four processor cores with 8GB RAM. You’ll enjoy weekly backups. My only concern is that they don’t seem to provide managed services or priority support. Just looking at their prices, you can tell that Mesi has the interests of both beginning and existing enterprises at heart. After converting the pricing of the starter package to dollars (from Pesos), the numbers are on the lower end compared to other web hosting services. My only concern is that their features don’t stack up with those of established names in the industry. It’s nice that they don’t lock customers into any contract. When signing up, you have the option to pay every three months or every year, and they accept bank transfers, Visa, and MasterCard payments. You can upgrade from any of the low level plans to the premium ones without much hassle. Though support is only available in Spanish, their team is friendly and extremely helpful. You can easily reach them on WhatsApp, send an email, or call live operators Monday- Friday from 9 a.m. to 6 p.m. They’re also accessible via live chat service. If you really want to master their account and features, I encourage you to check the detailed tutorials on their help page as well. You’ll learn how to setup emails, use FTP, and create and manage MySQL databases in no time. Mesi Hosting packages are suitable for entrepreneurs and business owners who need dedicated resources, ample storage, and VPS with more configuration options. Wondering how MESI stacks up against other Web Hosting companies? Enter any other Web Hosting company and we will give you a side-by-side comparison.